The GATHER foraging community helps people like you to confidently identify, harvest and safely use common edible and medicinal plants. Discover the forgotten food and medicine uses of wild plants, including their folklore and history. Each Foragers’ Notebook takes a deep dive into a specific wild plant. It's like having your own comprehensive plant library. Easily identify plants using the Gather photo gallery. A continuously expanding resource that gives you full colour, high resolution photos of wild plants. Stuck or got a question? Ask me, and I’ll personally answer. It's like having your own personal foraging mentor on speed-dial. Explore how to work with wild edible plants in the weekly members only podcast. This is knowledge you simply won’t find in the usual books or elsewhere. I share my personal experience from a lifetime of foraging. Including what I have learnt from years of traveling into jungle and remote wilderness to meet indigenous tribes. Plants in 60 seconds: Short to the point videos showcasing a specific plant. Private Facebook group for peer networking, discussion and team learning. GATHER is more than plant ID, more than recipes, more than a foraging guide, more than history and folklore. It is all of these and much more. A community encouraging insight, and an amazing Mentor. My awareness of the ecosystem in our nature reserve has greatly improved as a result. I thank Robin for creating this community and allowing us to learn from his rich experience, and in a very fun way. We encourage each other. We are different from other online learning spaces. First, we are not an app. We are not just a course or academy. Second, we don't view foraging as a passing trend. It is an ancient practice that helps restore connection to the natural world, and boosts your physical and mental wellbeing. A path to peace, contentment and serenity. A way to become empowered and resilient. GATHER is for anyone who loves plants and foraging. It is about exploring the deep relationship between plants and humans. I've often heard people say they wish they could download Robin's brain and I think this is the closest we're going to get! The community and notebooks don't disappoint. GATHER! is a real blessing. Robin Harford is so passionate about foraging. What he doesn’t know about, it isn’t worth knowing about. My love of the plants and my interaction with them was given a massive boost by your knowledge. I am now starting the pre-study for a PhD in Mycology. Your enthusiasm for the world around us is infectious, thank you. They are 400 million years old. Modern humans a mere 200,000 years old. Our existence would not be possible without them. When we are born, and then throughout our entire life, every breath we take has been given to us by plants. Nothing in the human world could exist without plants. In the past our knowledge of the plant kingdom went deep … very deep. It is through remembering the myths, folklore and stories of plants and how they nourish and heal us, that we deepen our sense of belonging to the natural world. Robin Harford is a professional forager, ethnobotanical researcher, and wild food educator. He gathers wild edible plants on a daily basis, and is the creator of the UK’s leading wild food site eatweeds.co.uk, which is listed in The Times Top 50 websites for food and drink. Robin has been writing, filming, publishing and teaching people about their local edible landscape since 2008. 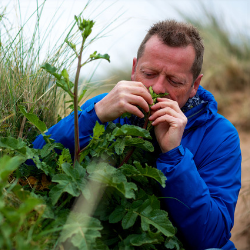 Recently his foraging courses where voted #1 in the country by BBC Countryfile. He travels extensively documenting and recording the traditional and local uses of wild food plants in indigenous cultures, and his work has taken him to Africa, India, SE Asia, Europe and the USA. Robin has taught foraging at Eden Project, appeared on BBC2’s Edwardian Farm, Soul Seekers TV series, on national and local BBC radio. Featured in: BBC Good Food magazine, Sainsbury’s magazine as well as in The Guardian, The Times, The Independent, The Daily Telegraph, GQ, The Ecologist and Green Parent, to name a few. This post is only available to GATHER! members.